Ok, this is just sad. 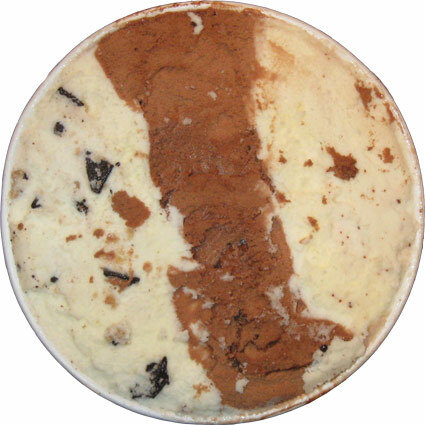 We have had only -1- Edy's flavor review on the blog this year. You don't think that sounds that bad? Well, consider the fact that I had 6 free coupons in my possession and I still hadn't pick up anything new, that is, until the other day. 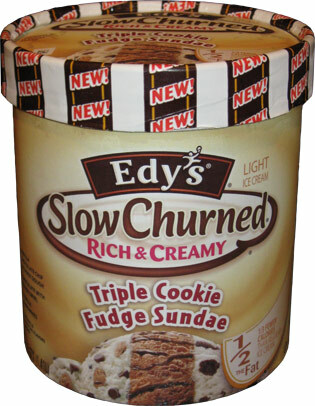 This is Edy's new Slow Churned Triple Cookie Fudge Sundae light ice cream. Now I bet you are thinking "Hey, wait, I thought TCFS was one of those frozen dairy dessert fun flavors? yeah, it is, and it comes in a red container doesn't it?" Well, you are right. There is a 140 calorie fun flavor version, and then there is the 110 calorie slow churned version. The slow churned seems like the healthier option, so let's crack it open. 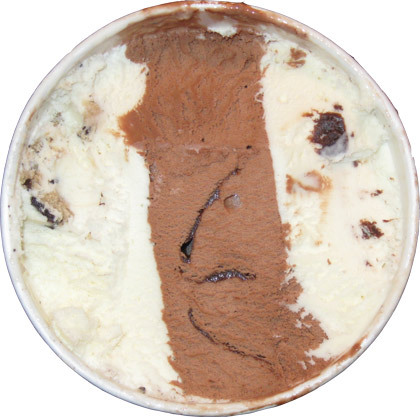 I hate to say it, but at first glance this ice cream looks kind of fun. There is a certain wow factor here until reality sets in. What I learned after my first bowl was that even though shoving 3 flavors in a thin container may look neat, it is horribly impractical. It's not like you can just scoop out your favorite flavor or go spelunking for cookie dough bits. It's all or nothing! I made myself a bowl and while I don't have a problem with what I'm eating, it's shockingly boring. The initial wow factor quickly wears off as you desperately look for brownie or cookie dough bits. It's ice cream and that's it. No flavors are standing out, nor are any textures. This ice cream is surprisingly dull. It's a shame they didn't go a bit more crazy... heck, maybe have one of the flavors be strawberry based. Oh, quick marketing compliant here. The container shows mini chocolate chip morsels, but when you start digging in you will actually find thin chocolate chunks. That doesn't really matter... but what I need to stress again is the lack of mix ins. I dug out two servings Tuesday night and I spied like one ball of cookie dough. It was pathetic. On Second Scoop: I've already gone back for the second scoop and it wasn't any better. It's not a bad ice cream, there is just nothing special to it. You say triple sundae and my brain takes me away to a scoop shop, but then I have my first bite and I'm right back to reality, in my kitchen, with a bowl of nuttin' special. No flavors stand out, there aren't enough bits and chunks, and it really just is. I even went so far as to make a shake on the third scoop, but that was boring too. Dubba's Notes: I don't want to take total blame here for not noticing their new 2011 products, it's not like Edy touts the new flavors.... Ok, found a Nestle PDF and it says Mud Pie was also new this year... oh, and a key lime pie froyo, interesting. Their slow churned line is pretty gummy too. My question is how does Edy's stay in business? The past 5+ yrs with the frozen dairy dessert business really killed their quality! What gives? I can thing of two reasons: Price and brand loyalty. Short of going generic, it's usually the cheapest option. If you've eaten Edy's forever, you tend to stick with it. I had this last night and agree with you, 100% boring and disappointing. Such a bummer after the excitement of making THIS flavor choice from all the other options. A few times, when I was eating the brownie section and not finding brownies, I picked up the carton to ensure I read the product description correct. I did they just didn't put any brownies in! The cookie dough has slightly more mix-ins but not enough to warrant the $5.99 price tag! My family and I enjoyed this ice cream very much. I'm sorry so many people had a hard time finding the filling pieces but for us it was just right. We bought it on sale for a price just $2.50 (less if you have a coupon). My oldest who is 13 and loves cookie dough thought it was just as good as we get at our local friendly's ( minus the cherries they always give her extra). My son who is 12, has autism and is a total chocolate freak ate through the vanilla flavors and removed the brownie pieces because of texture, which my 8 year old gladly took. Personally I would love to see this as a full time flavor.